I have really been into J.Crew clothes lately. First the shorts, now this amazing jacket! I went to a nautical themed birthday party last weekend and I had to find an outfit. I had picked up a cute shirt (also from J.Crew) but when I checked out the weather report I knew I was going to need a cute jacket. My black Northface would have ruined the whole look. So I stopped into J.Crew at least thinking I would find a cute little jean jacket, then I looked and saw this! 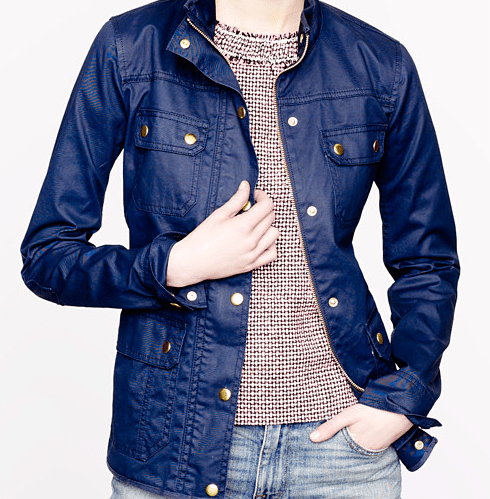 The Downtown Field Jacket in navy with gold buttons. It was love at first sight and went perfect with my outfit. I am loving navy this season. This jacket really works as a rain jacket and just a cute windbreaker. It is an interesting material that could wear well if wet. It was perfect for the party and I am looking forward to wearing it with many more looks this spring. The Downtown Field Jacket can be purchased at J.Crew for $148.00 it comes in navy and brown. So cute!